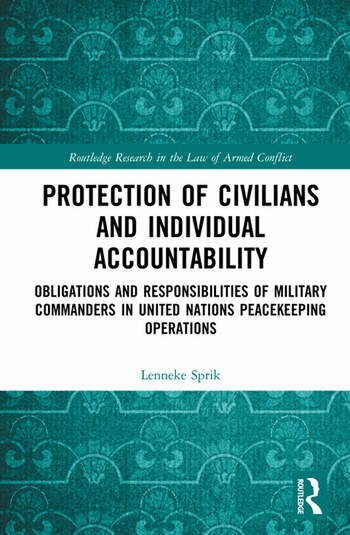 This book explores the question of whether peacekeeping commanders can be held accountable for a failure to protect the civilian population in the mission area. This requires an assessment of whether peacekeeping commanders have an obligation to act against such serious crimes being committed under domestic and international law. The work uses the cases of the Dutch and Belgian peacekeeping commanders in Srebrenica and Kigali as examples, but also places the analysis into the context of contemporary peacekeeping operations. It unfolds two main arguments. First, it provides a critical note to the contextual interpretation given to international law in relation to peacekeeping. It is argued that establishing a specific paradigm for peacekeeping operations with clear rules of interpretation and benchmark criteria would benefit peacekeeping and international law by making the contextual interpretation of international law redundant. Second, it is held that alternative options to the existing forms of criminal responsibility for military commanders should be considered, possibly focusing more clearly on failing to fulfil a norm of protection that is specific to peacekeeping and distinct from protective obligations under international human rights law and international humanitarian law. 4 Scope for Omission Liability under International Law? 5 A Legal Obligation to Act for the Peacekeeping Commander? 6 The Peacekeeping Commander as Bystander: A Moral Obligation to Act? Dr Lenneke Sprik is a Lecturer in International Security in the Department of Political Science and Public Administration, Vrije Universiteit Amsterdam, the Netherlands.